Today, there are several trends that are forcing application architectures to evolve. Users expect a rich, interactive and dynamic user experience on a wide variety of clients including mobile devices. Applications must be highly scalable, highly available and run on cloud environments. Organizations often want to frequently roll out updates, even multiple times a day. Consequently, it’s no longer adequate to develop simple, monolithic web applications that serve up HTML to desktop browsers. In this talk we describe the limitations of a monolithic architecture. You will learn how to use the scale cube to decompose your application into a set of narrowly focused, independently deployable back-end services and an HTML 5 client. We will also discuss the role of technologies such as NodeJS and AMQP brokers. You will learn how a modern PaaS such as Cloud Foundry simplifies the development and deployment of this style of application. 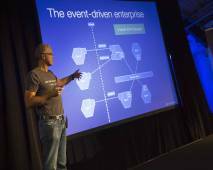 Also, see my presentations on event-driven microservices with event sourcing and CQRS as well as my presentation on a pattern language for microservices.